The California, Great Basin and Plateau culture region encompasses the western states and is surrounded by the Northwest, Subarctic, Plains and Southwest cultures. The California region boasts a wide variety of climates and geographical features, rivaling any other area of comparable dimensions. Nearly all but the eastern-edge California Native Americans lived where environmental conditions were favorable, making food relatively accessible. Along the Pacific Coast, they hunted fish and sea mammals by boat. Included were such California tribes as the Chumash, Yurok and Pomo. The Maidu and Pomo principally ate acorns, which have a higher calorie rating than wheat. They pounded the hard nuts with stones and washed out the bitter taste with water. The Pomo crafted what were arguably the finest baskets in all of indigenous America. They made baskets as small as a thimble and as big as a yard in width. They made watertight baskets for cooking acorn mush and seed gruel, as well as for carrying and storing food. They wove especially beautiful baskets for presents and as offerings to forebears. Some were bedecked with colorful bird feathers and shells. Their skill also was applied to trays, boats, headgear and baby carriers, such as a wickerwork cradleboard in which an infant spent his first year. Their mothers wore hats that resembled bowl-shape baskets. The California natives lived in communities numbering up to 2,000 with dwellings arrayed in groups. A house consisted of a round frame covered with grass. There was a skylight in the roof and the beds were made on skin-covered frameseach with a partition for privacy. In the center of the floor, they made a cook fire for seeds, nuts, fish and other foods. More than 100 languages flourished in California before European contact; most are gone today. Between the Rockies and the Sierra Nevada mountain ranges of California lies an arid and sparsely populated land largely consisting of desert. The land also features valleys, some with oases, and large hills as many as 5,000 feet high. Water and food were hard to come by in most of the area. Included in the Great Basin culture area are the Tubatulabal and the Owens Valley Paiute of eastern California and the Paiute, southern Shoshone and western Ute in the Great Basin of Nevada and Utah, among others. The area was generally too dry for farming and there were relatively few animals to hunt. Therefore, most of the natives subsisted on seeds and nuts, which they collected as they roamed about. 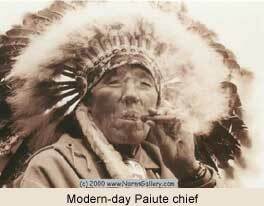 The Paiute and Shoshone gathered the sweet nuts of the piñon tree. Other natives gathered seeds from such plants as the pigweed and primose. When they could, these seed-gathering natives killed deer and antelope, and caught rabbits in the sagebrush. A few tribes ate boiled or roasted grasshoppers. Given that food was scarce, they had to stay on the move to find it. Most of these natives trekked over the countryside on a routine route every year, gathering seeds as they ripened. Because of this, their dwellings were temporary. Every family had up to three camps to visit in a year. The natives made a shelter by putting up a frame of poles in a round or beehive shape. They had no bark or skins to cover the shelter, so they tied bundles of grass or desert bushes to it. They heaped earth over the house in winter. The inhabitants of the California and Intermountain regions used shells as currency, which eased trade among their several societies. In eastern Oregon and Washington, southern Alberta and British Columbia, northern Idaho and western Montana, mountains are draped with evergreen forests and the valleys are grassy. The summers are hot, and the winters are long and cold. A pattern of life similar to Great Basin peoples existed on the Plateau, but it was enhanced by annual runs of salmon up the Columbia River, other rivers and tributaries. The Plateau natives also had to move a lot; they traveled on foot while dogs pulled their goods. Where there were lakes, they found other fish, ducks and mud hens. In the meadows, they pulled up camas (edible bulbs) and other nutrient-rich tubers and roots. They dried salmon and camas for winter consumption. People lived in villages made of partly sunken circular dwellings in the cold months and camped in grass mat houses in the warm months. Market villages existed where trekkers from the Plains and the Pacific Coast congregated, purchased dried food and bartered for other items. In approximately 1740, the Plateau natives began to trade with the Plains natives for horses, which brought significant changethey were then able to travel much faster in search of food. These tribes included the Bannock, Colville, Umatilla, Flathead, Kutenai, Nez Percé, northern Shoshone and Yakama. Most of them combined the customs of seed-gatherers with ways of life they learned from their Plains counterparts. They also gathered seeds, nuts and roots, but most of them hunted bison by horseback. Many lived in tipis. Seed-gathering and trading were common among inhabitants of all three regions. Altogether some 85 major native groups and numerous subgroups lived in these regions up to the 1850s. See also Lewis and Clark Expedition . Report of the riot having been received at Far West in a much exaggerated form, Joseph Smith with two hundred others went on to Adam-ondi-ahman to investigate, but finding all quiet, turned around and called on a justice of the peace, Adam Black.